note: a newer version of this example is in progress..
Hi there, my name is Joe Lambda, and I work at ACME Inc.. You can contact me by email at joe.lambda@example.org, or get more info on my personal home page. 15 Jan 2004 I'm all set. It's gonna be great! Hmm... maybe I'll put my itinerary online so folks can tell if they'll be in town at the same time I am. 4 Dec 2003 Whee! Web publishing is fun! This page is a fake home page for Joe Lambda, with the purpose of demonstrating how to mix several RDF vocabularies in XHTML using a technique involving XSLT. The output of this can be seen as RDF using the demonstrator based on an XSLT servlet. This page also uses FOAF autodiscovery (ie. link rel="meta" conventions in the document's head) to link to the derrived RDF data. 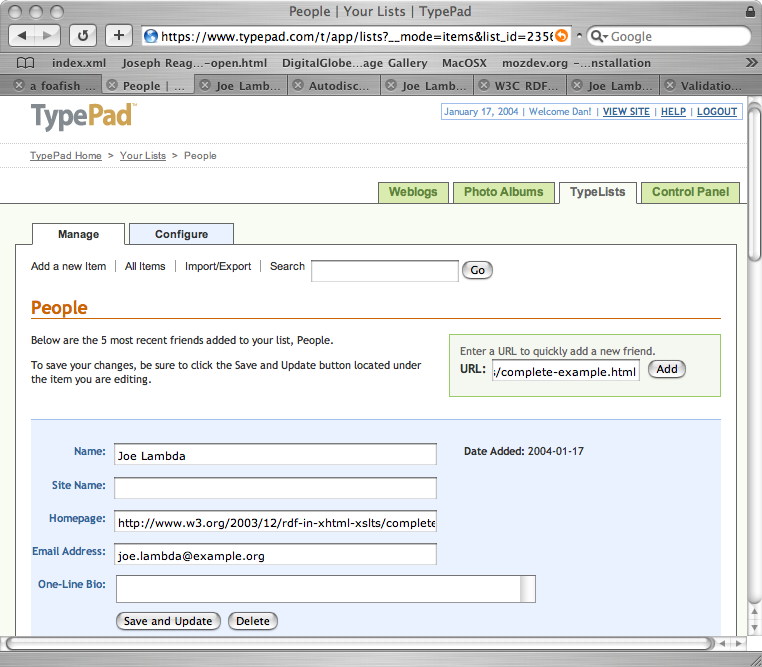 This allows tools such as FOAF Explorer or the TypePad weblogging service (see screenshot of "add a friend" facility) to exploit a machine-readable view of the data in this document. This page is licensed with a Creative Common License allowing copy and redistribution with attribution to the author, and disallowing derivative works.